Stahlhelm is the German word for "steel helmet". Since WWI, the German military helmet has always been a distinct icon--beginning with the Pickelhaube (spiked combat helmet) and transitioning to the various Stahlhelm variants of WWII. 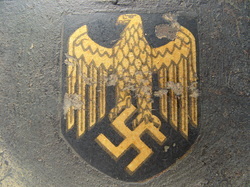 Both German and Allied military propaganda used the German helmet due to its instant recognizability. Although many WWI model helmets (M1916 - M1918) were refurbished and used in WWII, the focus of this section will be on the four most common German combat helmets worn during WWII. 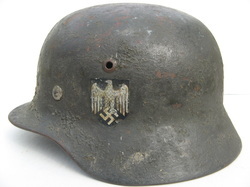 Manufacturing of the M35 began some time around 1935, and the German High Command began issuing the new model helmet to all branches of the military between 1935 - 1937. M35 helmets are known for their superior construction and paint finish. 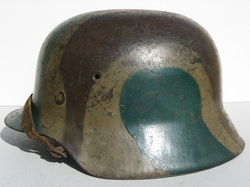 These helmets, depending on the factory, were issued in various shades of green. 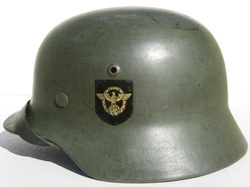 The M35 helmet was commonly issued with two decals--known to collectors as a "double decal". 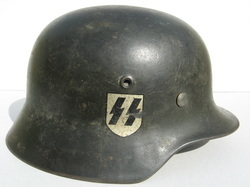 Many collectors seek these early helmets due to the workmanship and decal configuration. 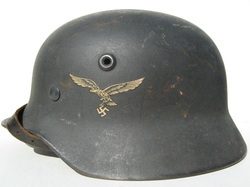 These helmets often went through refurbishment during the war. During this refurbishment process, it was common for a helmet to receive a new paint application, a new decal, a new liner, and any other necessary work. 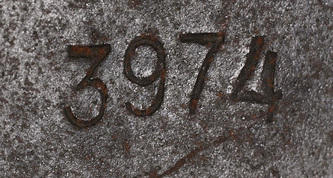 Therefore, many M35s will display a finish and decals different than what they were originally issued with. The easiest way to identify an M35 helmet is by examining the bottom edges of the helmet and the vent holes. 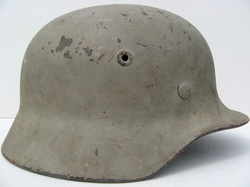 If the edges roll under the helmet and if steel rivets were placed in the vent holes, the helmet is a German Model 35. 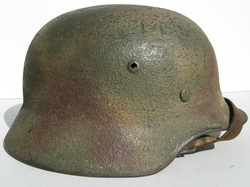 In early 1940, the German combat helmet underwent a significant change in order to simplify its construction and to reduce the its overall glare and visibility. 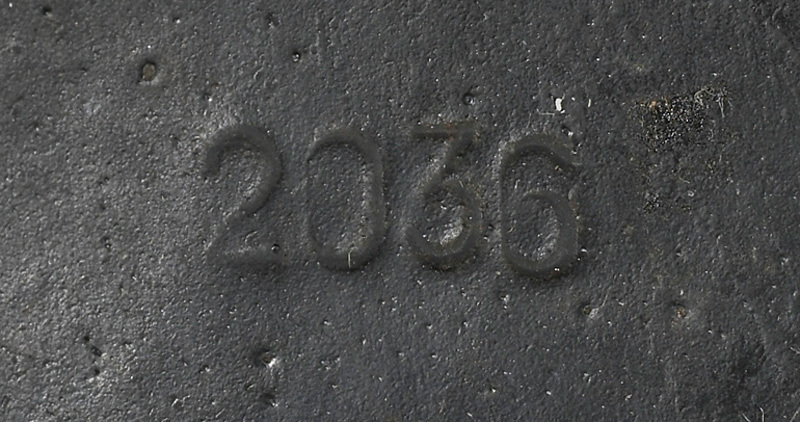 The new helmet, named the "M40" by collectors, featured the following changes: a rough textured factory paint finish, a slate-grey standard paint color, stamped vent holes, and a smaller silhouette. 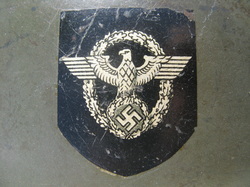 The removal of the national shield (tri-color) began some time between the transition from the M35 to the M40; therefore, very few M40s contain a second national shield decal. The M40, however, still boasted a similar overall shape with a flared skirt and rolled edges. Again, the easiest way to identify an M40 helmet is to look at the vent holes. 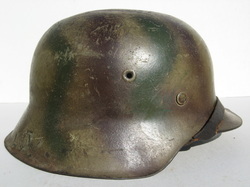 If no rivets were inserted into the vent holes and the skirt edges roll under, the helmet is a German Model 40. 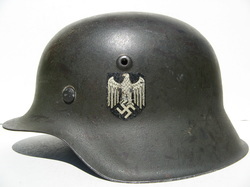 The German combat helmet design went through a dramatic overhaul in 1942. The new design, known as the “M42”, was a result of wartime demands. The rolled edge along the base of the shell skirt was eliminated—replaced with an edge that flares away from the helmet. 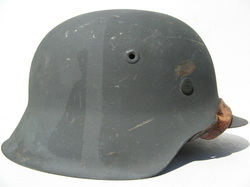 The elimination of the rolled edges expedited the time to manufacture the helmet and reduced the overall production cost. At the factory, the new helmets received a light application of matte gray-green paint. In addition, helmet decals were gradually eliminated. Both of the lighter application of paint and the elimination of decals sped the production time and reduced the helmet's combat visibility. The M42 is very easy to identify given its unique characteristics. The manufacturing standards of the M42 fell well below those exhibited in the M35 and M40. 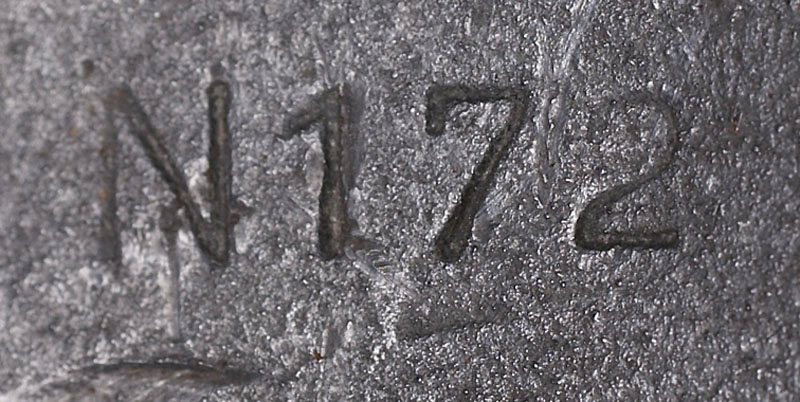 As a result, the M42 is often susceptible to rust and deterioration over time. Despite the crude nature of this late war helmet, the M42 is iconic and is considered the quintessential German WWII combat helmet. 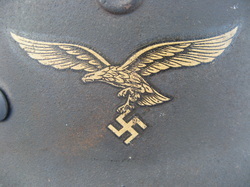 A majority of German WWII combat helmets will fall under one of the following organizations: Heer (Army), Luftwaffe (Air Force), Kriegsmarine (Navy), Waffen-SS (Paramilitary Force), or Feldgendarmerie (Combat Police). The Wehrmacht was the united armed forces of Germany from 1935 until 1945. The Wehrmacht was comprised of three main branches: Heer, Luftwaffe, and Kriegsmarine. In addition to the Wehrmacht, the Waffen-SS and various other organizations fought for and in defense of Germany during WWII. 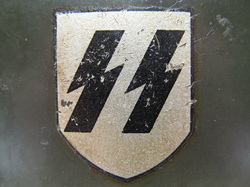 The Waffen-SS was the combat branch of the SS--Germany's paramilitary organization. The Feldgendarmerie was a Police organization forced into a combat role. Identifying the military branch will be an easy task--the Kriegsmarine being the exception. 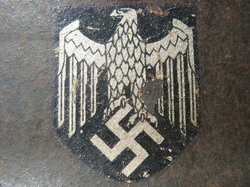 Kriegsmarine decals are nearly identical to Heer decals. The only differnce between the two decals is the original issued color, Kriegsmarine being gold. Heer decals can, however, "tone" over time and take on a golden color. Therefore, when deciding between Heer and Kriegsmarine, pay close attention to the overall color and the consistency of the decal. 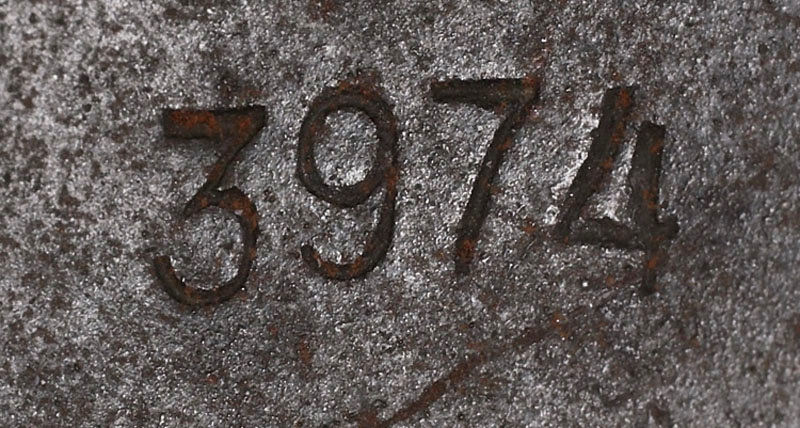 Toned Heer decals will lack the consistent deep metalic gold color of a Kriegsmarine. Below are examples of the decals representing each military organization described above. 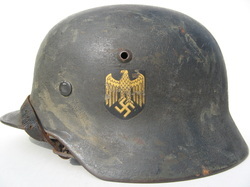 German combat helmets were made by several different manufacturers during WWII. 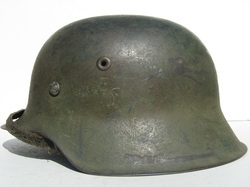 And, unlike the US M1 helmet, the German helmet came in a variety of sizes. 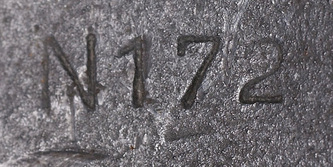 For collectors, it is always important to identify the manufacturer and size of a helmet. 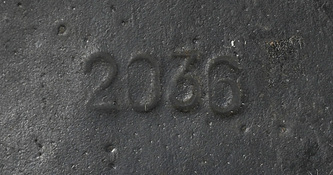 This is easily discerned by locating the manufacturer code and the size stamp underneath the skirt of a helmet. 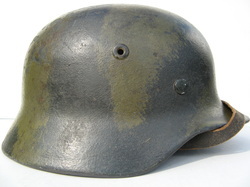 The typical sizes of German helmets are: 60, 62, 64, 66, and 68. Throughout WWII, the German military used camouflage effectively. German soldiers camouflaged vehicles, helmets, uniforms, and field gear using a variety of mediums, patterns, and schemes. 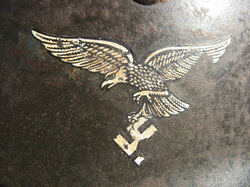 The sheer number and variety of German WWII camouflaged helmets, or "camo" helmets, is proof of this. 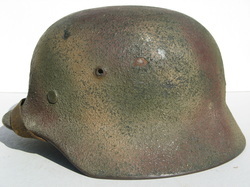 The camouflage applied to WWII German helmets included some of the following mediums: thick brush applied paint, spray paint, vehicle paint, house paint, and paint mixed with sawdust, wood chips, sand, concrete or Zimmerit. Rubber tubes or bands, chicken wire, and other various wires were added to helmets--allowing soldiers to attach foliage to their helmets. Many German soldiers were very creative and even artistic when applying a camouflage pattern to their helmets. Therefore, many exotic WWII German camo patterns exist. Striped, swirl, turtle shell, dabbed, and tri-color are just a few examples of these camo patterns. The location and the season of the fighting dictated the camo scheme used. Several common camo schemes exist: North Africa camo / DAK camo (tan and pink), winter camo (vehicle whitewash or white based paint), Normandy camo (tri-color--green, tan, and brick red), and Mediterranean camo (light green, tan, and brown). 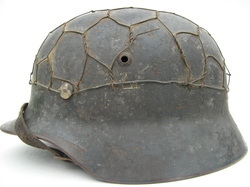 WWII German camo helmets are extremely desirable. 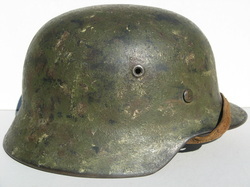 German camo helmets command a very high price from collectors. However, many reproduction camo helmets exist, and collectors should use extreme caution when purchasing a camo helmet. No standard method of authenticating a camo paint application exists; therefore, experience, forum inquiries, and the help of advanced collectors are the best way of authenticating a camo paint application. Pith helmets are lightweight colth-covered helmets made of cork or pith. The German Afrika Corps (Deutsches Afrikakorps) utilized the pith, as did some German soldiers in Crete and other tropical regions. 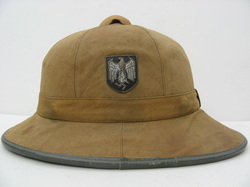 The WW2 German pith helmet was issued to all military branches and was worn primarily in non-front-line areas. Two patterns of the German pith helmet exist--1st and 2nd. The 1st pattern pith helmet was covered by a canvas material. The 2nd pattern pith helmet was covered by a felt material. For donation information, please visit our Donations section.